PR Newswire - NEW YORK, April 11, 2016 -- As content marketing has become a widely used component of B2C and B2B campaigns, it’s no longer enough for brands to simply create content. For content marketing to be truly effective, brands must share their content to engage audiences, drive demand and generate leads and revenue. PR Newswire has made it easier for marketers to influence consumer and professional purchasing decisions with Content Marketing Kit. 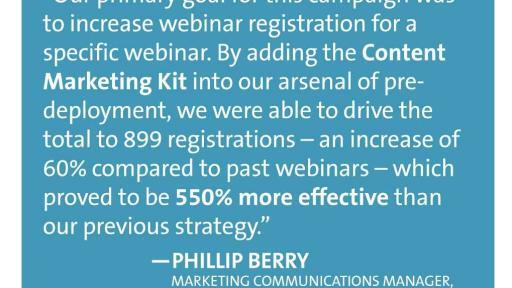 Content Marketing Kit offers integrated tools that allow marketers to share their brand’s content with marketplace influencers, and capture valuable leads through one marketing solution. Drive audience action through a tailored call-to-action button directing traffic to owned channels. Each Content Marketing Kit includes a branded landing page built by a dedicated service team of project managers who will proofread, optimize and distribute content. Also included are distribution via PR Newswire’s curated industry Twitter feeds and a branded HTML email to send to relevant influencers and contacts. The Content Marketing Kit also includes 5,000 target audience pageviews via strategic placement across premium websites and blogs. Marketers can track and report on the ROI of their efforts with PR Newswire’s Visibility Reports. Compelling content and a multichannel marketing strategy can help brands build awareness, attract customers, drive them through the sales funnel and achieve revenue objectives. For tips on how to make a product campaign thrive, download our white paper Make Your Product Launch the Start for a Multichannel Content Promotion Plan. 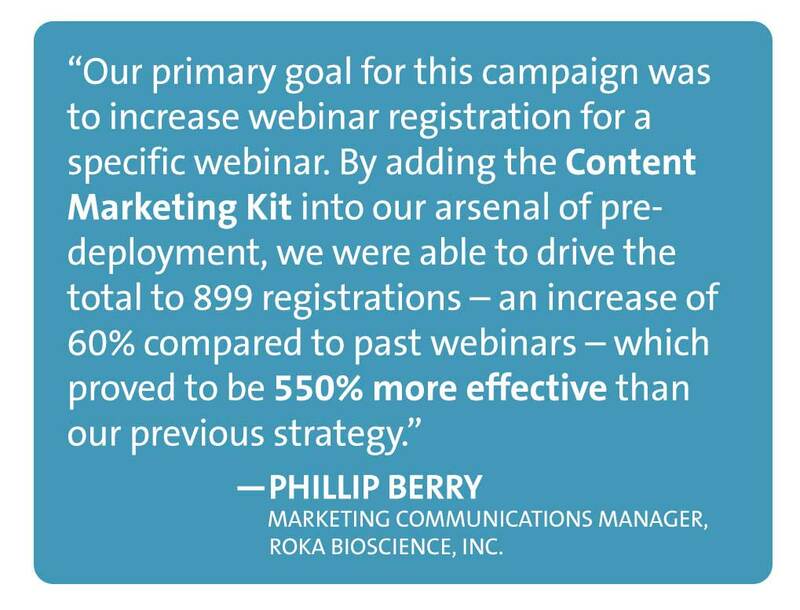 Content Marketing Kit proved a successful tactic for Roka Bioscience, who increased webinar registrants 60% using an embedded lead generation form on the branded landing page.